Cafezique opened to a round of applause from locals, who've been madly in love with its parent, Delizique, for years now. A huge bar, with open plan kitchen behind and a totally fab mezzanine level above, make the most of a cosy space. Don't be worried about the big photo of the handsome young man pointing a rifle over our heads. He's a good guy, really. Owner Marion's grandpa, called Zique (that's where the funky name comes from) fought against the fascists in the Spanish civil war, and is now looking after our safety, gun still in hand! The food is probably the best in any Glasgow cafe. It was worth waiting for. All rolls, breads and scones are baked fresh daily in Delizique. Staff in white aprons trot down the street, laden with trays of still-hot treats for us. Eggs benedict explode gooey loveliness over cripsy bacon, soaking into the fresh muffin. Scrambled organic eggs ooze into piping hot toast. Heaven! A large glass of fresh organic orange juice washes everthing down a treat. As well as snacks, all day breakfast and brunch, Cafezique takes a bow with top-notch evening meals as well. Check out the restored school blackboard on the wall by the side door for what's up for grabs. The menu changes all the time. But expect lots of unusual veggie dishes, and organic meats and fish. Try rabbit stew, or spiced langoustines, for example. 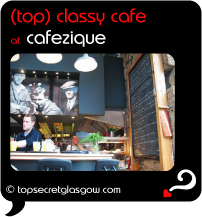 On a very pretty West End street, Cafezique is easy to miss, but well worth a saunter into quiet, leafy Dowanhill. Great news! Finding this page means you can now join our VIP list for Cafezique. Grab your very own web page all about Cafezique. Do you have a special story about Cafezique? A funny experience? A grand occasion? A funky photo? A personal tip? A top secret?